The Cemetery is located north of the town Antwerpen off the N133, a turning off the N1 which runs from Antwerpen to Zundert. Driving from Antwerpen follow the N1 to the village of Wuustwezel, here you turn left onto the N133 towards Essen. Go through the village of Nieuwmoer and carry on to Essen. On the edge of the town is a junction, go straight over towards the town and take the next turning on the right, Watermolenstraat. Follow this road into Horendonk. Going into the village turn right past the school into Dreveneind and the cemetery is on the left. The graves are just inside the entrance. 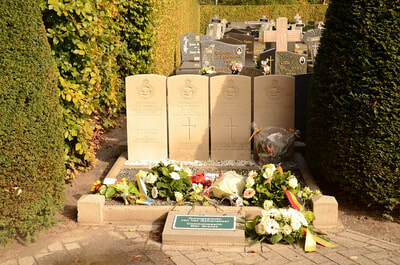 Essen (Horendonk) Communal Cemetery contains the graves of six Commonwealth airmen of the Second World War. 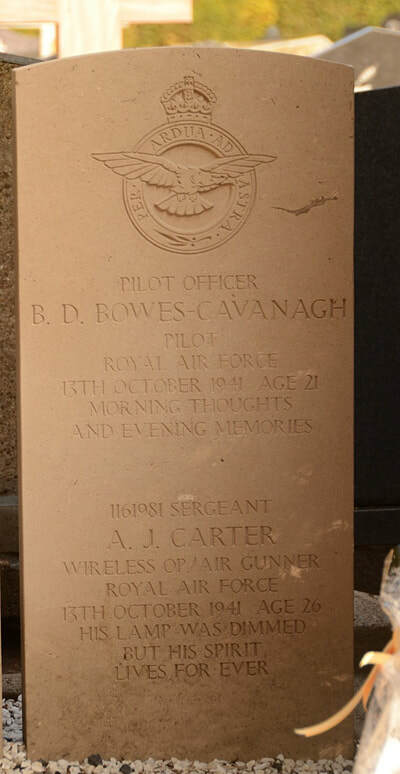 89371 Pilot Officer Brian Derek Bowes-Cavanagh, Pilot in 207 Squadron, Royal Air Force Volunteer Reserve, died 13th October 1941, aged 21. Son of Gerald Richard and Cecilia Gwendoline Bowes-Cavanagh, of Hampton, Middlesex. 1161981 Sergeant Andrew Joseph Carter, Wireless Operator/Air Gunner in 207 Squadron, Royal Air Force Volunteer Reserve, died 13th October 1941, aged 26. Son of Stephen Benjamin and Kate Ada Carter, of Over, Cambridgeshire. 999653 Sergeant John William Leason, Air Gunner in 207 Squadron, Royal Air Force Volunteer Reserve, died 13th October 1941, aged 28. Son of Thomas and Susan Leason; husband of Enid Leason, of Hull. 921874 Sergeant Ian Harry Deare Passy, Air Gunner in 207 Squadron, Royal Air Force Volunteer Reserve, died 13th October 1941, aged 20. Son of Maj. F. H. B. Passy (formerly Indian Army), and Margaret Alexandra Passy, of Cornwood, Devon. 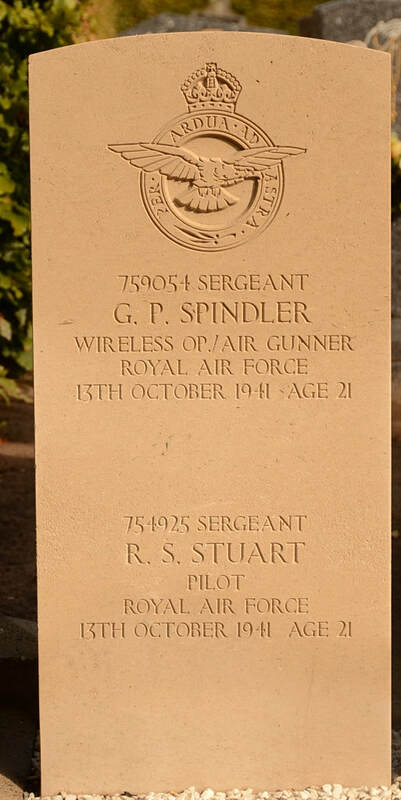 759054 Sergeant George Paul Spindler, Wireless Operator/Air Gunner in 207 Squadron, Royal Air Force Volunteer Reserve, died 13th October 1941, aged 21. Son of George Charles and Pauline Spindler, of Luton, Bedfordshire. 754925 Sergeant Robert Surfleet Stuart, Pilot in 207 Squadron, Royal Air Force Volunteer Reserve, died 13th October 1941, aged 21. Son of George Arthur and Lizzie Stuart, of Narborough, Norfolk.